All drivers multitask. They monitor the traffic in front of them, behind them and beside them while they also monitor vehicle speed and other internal performance gauges. If drivers add additional tasks, they quickly become overloaded. It’s is no wonder distracted drivers seriously injure close to half a million Americans per year in vehicle collisions. Like many other states, Illinois has a limited cell phone ban. If drivers violate this law, or another safety law and that violation substantially causes injury, the tortfeasor (negligent driver) may be responsible for damages as a matter of law. Other distracted driving claims involve negligence, or a lack of ordinary care. If a breach of a legal duty substantially caused injury, the tortfeasor may be liable for damages in these instances as well. As mentioned, drivers sometimes take their eyes off the road to check their speed or investigate a warning, like a low fuel light or a low oil indicator. That conduct, while technically visual distraction, is clearly not a breach of a legal duty. Other drivers take their eyes off the road for a moment to talk to a passenger, adjust the audio input on their stereos, or take in the sights of scenic Rockford. In that moment, which may only be a second or so, a vehicle travelling 40mph goes forward about 60 feet. A lot can happen in those 60 feet. At the scene of an accident, many drivers voluntarily make statements like, “I was looking out the window and did not see you.” They believe these statements excuse their negligent conduct. The opposite is true. In court, the victim/plaintiff can use that admission against the tortfeasor and bolster a claim for damages. As the name implies, hand-held cell phones may be the most manually distracting gadgets ever invented. As these devices became smaller and more functional in the smartphone era, manual distraction increased even more. Cell phones are just the most obvious source of manual distraction. Eating while driving, applying makeup while driving and drinking while driving are all manually distracting. If the manual distraction violates a safety law or amounts to a lack of care, the tortfeasor may be forced to pay significant compensation, as outlined below. To combat the rash of cell phone-related distracted driving claims, manufacturers rolled out a number of hands-free devices, from cell phones that are incorporated into the vehicle’s dashboard to small frames, which hold hand-held devices. These new gadgets solved the manual distraction problem, but they may have done more harm than good. Studies show using a hands-free device cognitively distracts a driver, not only while the driver is using the device, but for several seconds afterwards. In other words, hands-free cell phones cause more cognitive distraction than hand-held cell phones. Additionally, many hands-free devices give drivers a false sense of security. So, they are more willing to take risks in other areas. 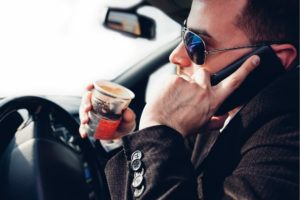 In all three kinds of distracted driving cases, available damages usually include compensation for economic losses, such as medical bills, and noneconomic losses, such as pain and suffering. There are several different forms of distracted driving and they all may lead to serious injury. For a free consultation with an experienced personal injury lawyer in Rockford, contact Fisk & Monteleone, Ltd. We routinely handle matters in Winnebago County and nearby jurisdictions.